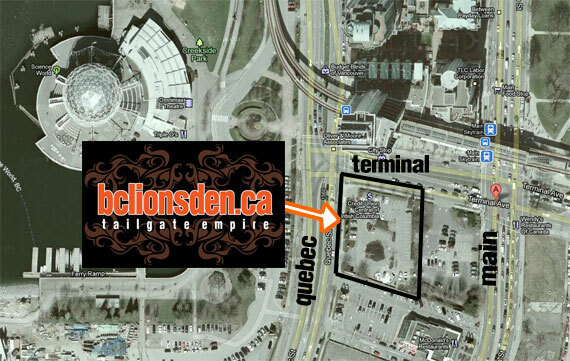 You are here: Home / Den Talk / Tailgate Empire lives on in downtown Vancouver as we return “home”. Tailgate Empire lives on in downtown Vancouver as we return “home”. Remember the days of tailgating at the PNE fondly Lions fans…it’s unlikely you’ll ever have it that good again. That said, Tailgate Empire will live on in the streets in Vancouver thanks to our friends at Easy Park. The BC Lions sent out e-mails to their season ticket holders yesterday offering parking 6 blocks away from the stadium under Pacific Centre Mall. And while the price is definitely right at $21.36 including taxes for all four games at BC Place, an underground parking lot obviously can’t facilitate tailgating. The Lions staff took some much appreciated time to speak with me yesterday and while they wished us the best of luck in our tailgating future, there isn’t much they can do about it. Parking lots around the stadium are disappearing at the expense of real estate development and those that remain are privately owned lots that refuse to allow tailgating. The PNE model proved once again that if tailgating is done with planning and some simple rules in place, it provides a great game day atmosphere for fans and even creates new ones for the team. Tailgate Empire will continue to pursue this tradition in Vancouver until we simply have no options left. With that said, our regular group of tailgaters will be setting up shop at the Easy Park lot at Main and Terminal. The great folks at easy park gave us this lot during the last season at BC Place, and have graciously offered it to us once again on our return. The lot is one skytrain stop or a 10 minute walk to BC Place. This is a small lot so spots are limited. Also there are some critical rules you must adhere to of we wish for this to continue. 1) Your spot must be paid for apon arrival. If that means you pay extra for arriving early, that means you pay extra. 3) All garbage must be removed by tailgaters. COME PREPARED. 4) All beverages must be in plastic cups. 5) There are no washrooms on site. Do not make the lot your washroom. 6) Eachl tailgater vehicle can only take up one parking spot. There is another option for Lions fans pregame entertainment and that is the official club Street Party outside of Terry Fox Plaza on Beatty Street. The Lions staff have put a lot of effort into providing a great atmosphere for fans of all ages and on September 30th it will be their biggest event yet to celebrate the reopening of BC Place stadium. I want to thanks the great people at Easy Park, in particular Greg Watrych who has gone out of his way to give us a home! Whenever you park downtown, please consider their lots for your parking needs! So Tailgate Empire, we’ll see you on Sept. 30th at our new/old home!